Logan has been a weather fanatic for as long as he can remember. Fascinated by the power and beauty of Mother Nature, Logan has from a young age sought to learn as much about weather as he possibly could. In 2004, hurricane Charley moved up the coast of Florida. Logan, as a teenager, was steadily watching, drawing sketches of possible outcomes on his notepad. He finally settled on a solution that would have the hurricane take a hard right into Florida. Whether it was a lucky guess, Logan isn’t sure, but that successful forecast gave him the boost of confidence that he needed to begin charting a course into weather as a profession. Logan began studies at the University of South Alabama in 2009 and graduated in 2013. During this time, he came into contact with a group of experienced storm chasers and by April of 2014, Logan found himself in Mayflower, Arkansas, watching the first violent tornado of his career. Driving up onto the damage path of what would be rated a high-end EF-4 tornado, Logan found himself at a loss for words. The memories of the destruction of that day altered the course of Logan’s career forever. He became ever more enthralled by the forces of nature, but wanted to learn more about how people helped themselves and others before and after storms. In large part because of that, Logan acquired his Master of Science in Emergency Management in 2015. Logan worked as a Storm Warning Meteorologist at Accuweather Enterprise Solutions in 2015 and part of 2016, before venturing down to the Gulf Coast to help cover Hurricanes Hermine and Matthew for WeatherNation. 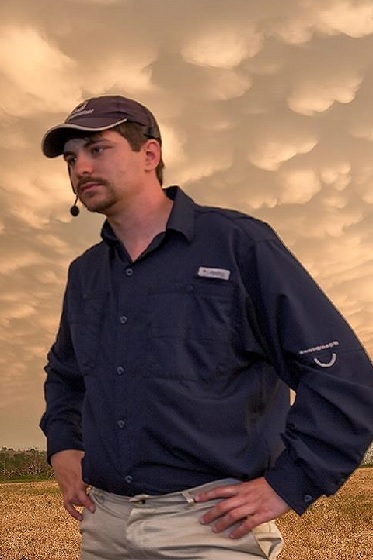 After these efforts, Logan joined WeatherNation full-time as a Field Meteorologist where he now covers some of the most extreme weather on the planet, from tornadoes to hurricanes to blizzards and everything in between! One of my earliest memories comes from the March 1993 Blizzard, coined by some as a "Super Storm". This storm left snow drifts even down into Alabama, and I vividly remember walking outside as a two-and-a-half year old and seeing the shoveled paths in the snow. Snow banks were well over the head of then-toddler me and it looked very much like a scene out of a movie. This storm set snowfall records that still stand in many parts of the country, particularly in the South and had a big part in sparking an interest in weather. It wasn't until much later that I realized my desire to do on-air weather. After doing work for WeatherNation for hurricanes Hermine and Matthew, I realized I could use the platform to impact lives far and wide. From that point on, I knew that a career in on-air meteorology was the right path for me. That day in Mayflower, Arkansas, will forever be a top weather experience for me. Others include watching a tornado near Chapman, Kansas bend railroad tracks, seeing multiple tornadoes on the ground at the same time near Dodge City, Kansas, and seeing the somewhat rare event of "Thundersnow" in Buffalo, New York. When not standing in or next to some incredible weather phenomenon, I enjoy spending time with my wife and two daughters. Having lived in Mobile, Alabama, for almost 6 years, I have a passion for all things "Beach" and "Gulf Coast" and love to go fishing. I also enjoy long walks on the beach. No, really! If I can't be at the beach, I often find myself doing a bit of web development or PC gaming. This is an easy one. My wife. We have been married for nearly a decade and I can't imagine life without her. She also lets me chase tornadoes. She's pretty cool! Without her constant support, I'd not be where I am today. I'd also be hungry. I’m not a good cook! I still get nervous as a public speaker, either in person or through television. When I start talking, though, it seems to fade away. I chalk it up to my confidence in my subject matter. I'm confident in that the weather story I'm telling is both scientifically sound and reflects what I know to be true as a meteorologist. If I had to talk about an entirely different subject, I'd either have to research it for days on end to know my subject or I'd be a nervous wreck! I hope that on-air weather presentation continues to be an important part of weather information dissemination. I think that with raw weather information and forecasts becoming more and more readily available, there is a tendency by some to discount the need of a communicator. On-air meteorologists, I think, are important in telling more than just the high and low temperatures for tomorrow. We want to tell you and show you how the weather is impacting you, something that a computer will never be able to do.